Deborah Kan’s career spans more than 15 years in print and broadcast journalism across Asia and the United States. 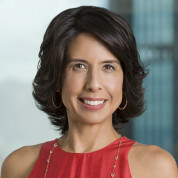 Currently, she is executive producer at The Wall Street Journal in Asia, leading the daily production of video news segments with Journal editors and reporters, as well as video interviews with business leaders and decision-makers. These video segments are featured online at WSJ.com, the world’s largest paid news website, as well as via WSJ Live, the Journal’s live news network for the iPad, iPhone and Internet TV devices. Prior to joining the Journal in 2011, Ms. Kan was a news presenter with Reuters Insider, the video news division of Thomson Reuters for financial professionals. Her broadcast experience also includes roles as anchor of “Star News Asia”, the award-wining newscast on Star World, as well as presenter of “Talk with Deborah Kan”. Throughout her career, she has conducted exclusive interviews with leaders in business and politics, including U.S. Vice President Al Gore, Pakistan Prime Minister Shaukat Aziz and Philippine President Joseph Estrada. Ms. Kan was also one of few international journalists to have interviewed Cambodia Prime Minister Hun Sen, and was the only television journalist from Asia to accompany the New York Philharmonic for their historic 2008 performance in Pyongyang, North Korea.